Scientists from the Department of Forensic Medicine at the University of Copenhagen have examined the bodies of three 500-year-old Inca children along with scientists from Bradford University in England. This has given new, detailed knowledge about the old Ince ritual ‘capacocha’ which also involved sacrificing humans. The results were published recently in the journal PNAS. 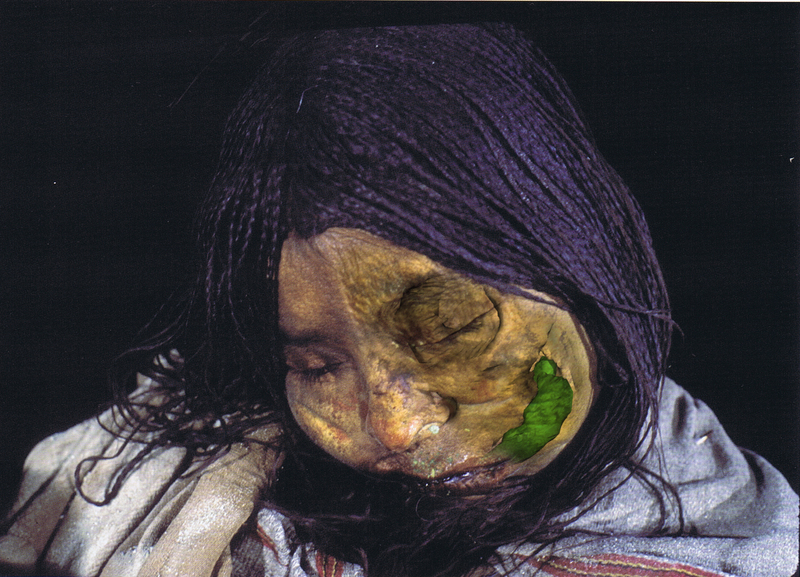 One of the examined mummies is the 13-year-old girl, ’The Llullaillaco Maiden’, named after the 6,379 meters tall volcanic mountain, Llullaillaco, where she was found frozen close to the mountain’s top. The two other bodies are a boy and a girl around 4 or 5 years old found in separate graves near The Maiden. The mummified bodies are all remarkably well-preserved and have been frozen for nearly 500 years near the top of the mountain, which is found on the border between Chile and Argentina. 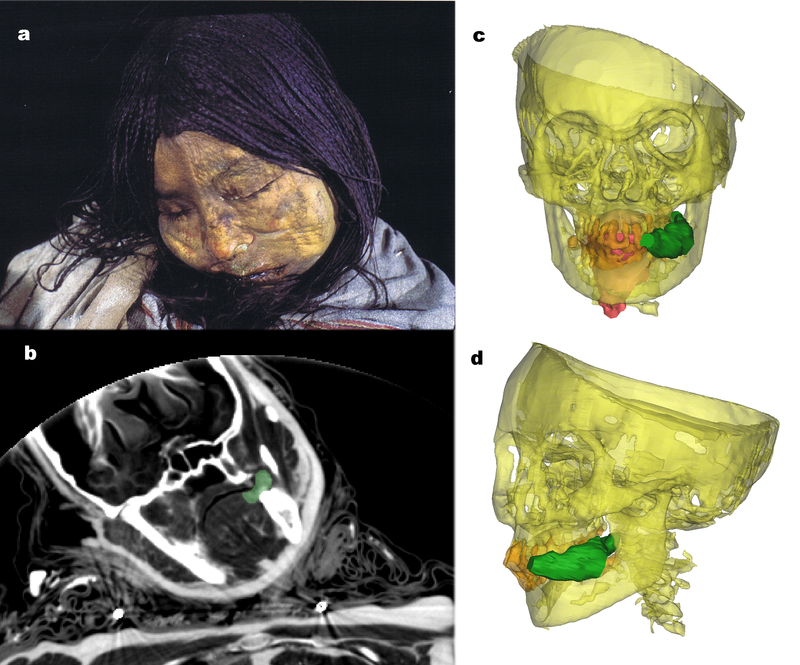 Professor Niels Lynnerup from the Department of Forensic Medicine and PhD student Chiara Villa have analysed CT-scans of three Inca children. On the picture you can see the girl called 'The Maiden'. Photo credit: University of Copenhagen. "Now we know more precisely what happened in an Inca sacrifice, for example to what extent coca and alcohol were used as part of the Inca ritual in the months and weeks preceding a sacrifice. 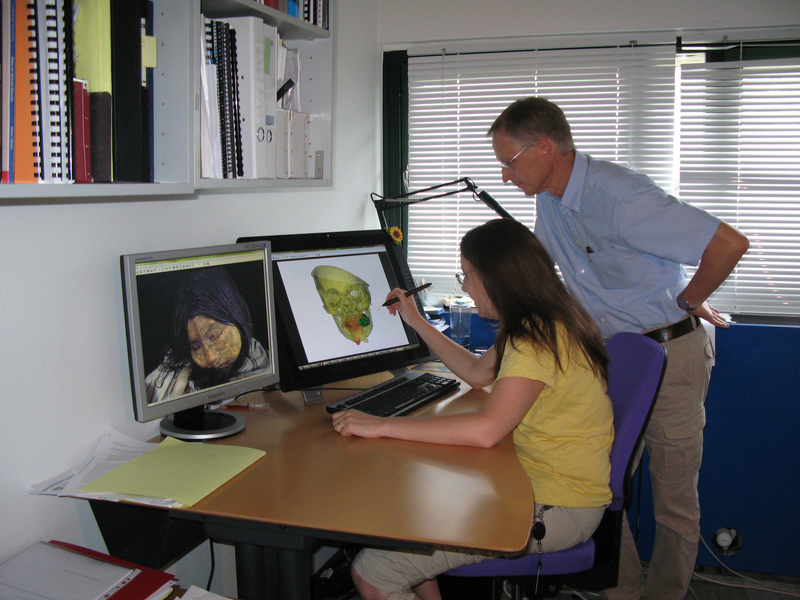 It is very satisfactory that we with our scientific methods can help uncover the unique circumstances regarding a number of very central aspects of ancient Inca culture," says Professor Niels Lynnerup from The Department of Forensic Medicine, who, along with PhD student Chiara Villa, has analysed a number of CT scans of the mummies. What we have known so far about the religious capacocha ritual from the Inca Empire, was derived from written sources from the Spanish colonial power in South America. The new analyses of the frozen bodies give new knowledge about the practice of the rituals, for example the child sacrifices. The 500-year-old Inca mummie 'The Maiden' is amazingly well presereved. Photo credit: Johan Reinhard. The scientists’ analyses show that the three mummified children had all ingested both coca and alcohol prior to their death. The girl, ‘The Maiden’, was even found with chewed coca leaves in her mouth, and the analyses show that her consumption of coca increased sharply twelve months before her death, and then peaked six months later. The analyses also show that her alcohol consumption peaked during the last few weeks before her death. "We made CT analyses and have produced three-dimensional visualisations of the mummified girl’s organs and the contents of her mouth cavity. From that we could establish her age relatively precisely just as the coca leaf stuck between her teeth and in her cheek also could be identified. Finally, because of the amazing preservation we could also determine the contents of the intestines, and thereby establish a reasonable time of her final meal," explains Niels Lynnerup. "We can see that the ritual sacrifice has been prepared for a long time and that sustained consumption of drugs apparently was a part of the preparations prior to the sacrifice itself," says Niels Lynnerup. CT scans performed at The Department of Forensic Medicine show that the 13-year-old girl, dubbed ’The Llullaillaco Maiden’, died with a clot of coca leaves in her mouth cavity. Photo credit (The Maiden): Johan Reinhard. Dr. Andrew Wilson is an associate professor at the Department for Forensic and Archaeological Sciences at University of Bradford. He compares in value the new research results with the historic accounts from the Spanish colonial time. The scientists can with some certainty say that ‘The Maiden’ was selected as sacrifice twelve months before her death. Also, she was most likely implicated in a number of rituals involving use of coca and alcohol, and both drugs were given to her under supervision for some time. The circumstances during her final few weeks with ‘The Maiden’ showing consistently increased levels of coca and alcohol consumption compared the younger children show that there must have been a need to sedate her in the last weeks of her life. This conclusion is verified by the position in which ‘The Maiden’ was found. Hun was found sitting cross-legged with her head sloping forward and her arms resting loosely on her lap. Her head piece was intact and the objects surrounding her were undisturbed. This leads the scientists to believe that she was placed in the tomb, heavily influenced by drugs. The article, “Archaeological, radiological, and biological evidence offer insight into Inca child sacrifice”, is published in the journal PNAS. Journalists are welcome to use the pictures in connection with this story. Click on the pictures in the text to download a large version. Please credit Johan Reinhard and University of Copenhagen. The Inca Empire was the largest empire in South America, and, at its peak, one of the world’s largest societies. The Empire emerged in the Peruvian highlands in the 1100s, and spread over a significant part of the western South America, by means of both conquests and peaceful assimilation. The last emperor of the Inca Empire fell at the hands of the Europeans in 1533. The mummy, dubbed ’The Llullaillaco Maiden’, and the two other children were found in 1999 by Dr. Johan Reinhard from National Geographic Society and Dr. Constanza Ceruti from Catholic University of Salta. The mummies are now stored at the Museo de Arqueología de Alta Montaña (MAAM) in Salta, Argentina. The Department of Forensic Medicine at the University of Copenhagen has contributed to research in Danish bog corpses and mummies from around the world on several occasions. Furthermore, the Department of Forensic Medicine conducts examinations in connection with trials. Several years ago, the department was one of the first forensic institutes in the world to introduce routine CT scans of bodies before the autopsy. The knowledge obtained by scanning could have significant importance to the cases. Also, the scans give better knowledge about for instance gunshot wounds and other types of lesions and conditions.